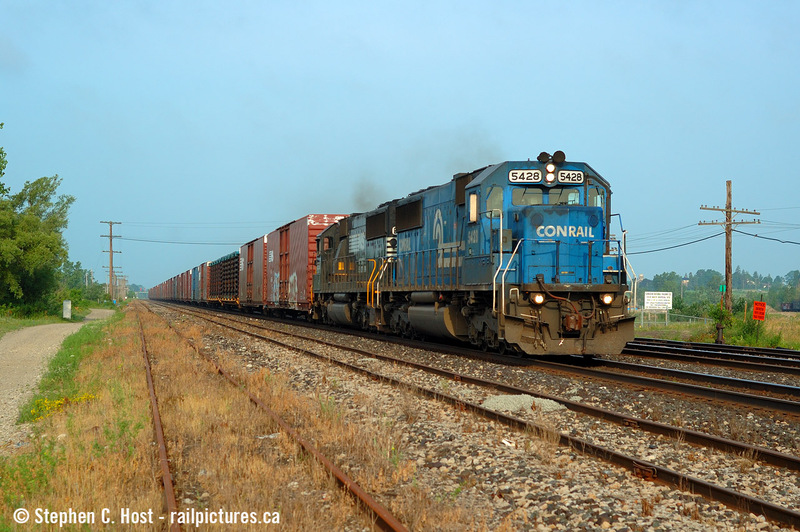 Railpictures.ca - Stephen C. Host Photo: I call this the “new wedgie”: Rail into corner? Check. Telegraph pole framing the shot? Check. Well, sorta. It’s quite small so it doesn’t really form much of a frame, but it’s there. I try not to mimic this “new wedgie” technique these days.. as it is becoming quite mundane, as is this location. However, the only things in this shot not mundane is that Conrail paint of that now retired NS SD50 in the lead, and of course, the great early morning light. The time is 0757 and NS 327/8 made sure you got out of bed early if you wanted to shoot either of these trains and I made sure I did. While half the time NS ran with ubiquitous and boring Dash 9′s in this era, when they didn’t you sure paid attention. | Railpictures.ca – Canadian Railway Photography – photographie ferroviaire Canadienne. Caption: I call this the "new wedgie": Rail into corner? Check. Telegraph pole framing the shot? Check. Well, sorta. It's quite small so it doesn't really form much of a frame, but it's there. I try not to mimic this "new wedgie" technique these days.. as it is becoming quite mundane, as is this location. However, the only things in this shot not mundane is that Conrail paint of that now retired NS SD50 in the lead, and of course, the great early morning light. The time is 0757 and NS 327/8 made sure you got out of bed early if you wanted to shoot either of these trains and I made sure I did. While half the time NS ran with ubiquitous and boring Dash 9's in this era, when they didn't you sure paid attention. 322 was always a Walbridge-Sarnia train, and 323 was simply Sarnia-Rougemere. After 2/29/96 they reverted to being Rougemere/Walbridge only. Thanks Bruce. I don’t blame you one bit really. It was a different world in ’96. BUT There *was* some Internet back then, but largely most of the people were not using it yet. I was certainly on it (since ’93) but didn’t know Trains was a hobby yet..
Oh I agree Myles – we were all caught off guard thinking the last run could be on the 31st. Someone let the word out at St. Thomas (Likely 328′s inbound crew) and word spread quickly from there. As for Fort Erie – right now the train meets with CN 531 to exchange cars around 1400-1500. Instead of setoffs and lifts, it’s basically now a planned direct transfer and runs much more predictably than before. But they are also much quicker and spend far less time on the Canadian side of the border. Re: CSX – Bruce could answer that one, I was still in Highschool chasing girls. Interesting that they didn’t run every day in the end, it’s a shame there’s not more photos of the last 327. I’ve never seen any photos of the last CSX trains on the CASO in ’96 either..
As for the NS Fort Erie transfer that’s at the Very top of my bucket list and plan a trip this spring to the Niagara region. I’ve waited for the NS at Fort Erie before but both times came up short. Steve, I’ve been to Sarnia to shoot the CSX before but with my luck, it was rainy so not the best shots. For Erie is still on my bucket list though! Liam make sure you go to Fort Erie for the transfer soon and over to CSX Sarnia. Time is running out. Probably a lot of guys who were out in those years thought this to be an “oh, well, it is better than nothing” lashup. We were spoiled. I’d sure love to see something like this again. Wonderful, basic uncluttered scene !! Ouch… we were all out for the last run – I chased it from London to Grimsby (not easy as they did track speed, despite being light power). But it was Christmas break and I was scheduled to go from Sarnia to Beamsville for another Christmas dinner – my timing was impeccable, Saturday December 30 2006 in the mid to late afternoon – NS 327 ran earlier that day, which we didn’t know about and very few captured on camera. I don’t remember where I saw the picture of the last 327, I think it may have been in the St. Thomas Times Journal. I think only one or two people captured it.. and it wasn’t light power. And the last thing is in the final months.. they didn’t run daily.. often holding a few days of traffic for one monster train.. it was quite unpredictable, but if a 327 ran, then a 328 would run the next day , so we knew at least that would occurr. I first got into photographing trains in 2006, and that fall I found out about the NS in Ontario and made a drive to St. Thomas the first week of Jan 2007 only to find out I missed them by a few days.. ohwell. Classic shot!